Conference presentations by us focused on marriage and parenting. Streaming versions of Bible Studies and Small Group studies. “Legacy” sermons by Bill. These are messages he delivered during his 15 years as a teaching pastor. With this membership, you will be automatically notified each time a new digital resource becomes available. 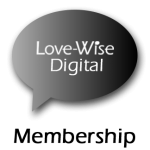 To become a digital member, click on the link below and start adding more wisdom to your love.